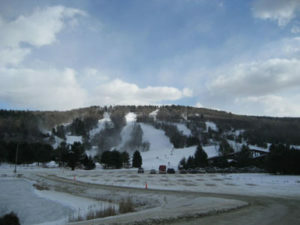 Three distinct mountain ranges comprise much of Connecticut’s skiing and snowboarding terrain. They are: Hanging Hills, The Berkshires, and Taconic Mountains. Located primarily in the state’s western quarter, these areas cover a vast range of qualitative differences—height, makeup, age, and size. Hanging Hills, a popular recreation resources for most Connecticut residents is characterized by its expansive views and steep, abrupt cliffs—sometimes dropping over 700 feet into the surrounding landscape. In contrast, the Berkshires—shared with Massachusetts—are a shallow and green range with a vibrant hiking scene. Finally, the Taconic contains several hundred miles of hiking trails, including large sections of the Appalachian Trail. Its history of conservation efforts make it a wonderful place to explore regional flora and fauna. Having a better understanding of the state’s geography and mountain ranges can help you understand ski resorts before making the drive from New Haven. For example: If you know that Hanging Hills is composed of trap rock ridges, your slopes will likely be steeper and rocky. In contrast, the Taconic Mountains may offer shallow, smooth rides. In New Haven, there’s no reason to not be familiar with these ranges—though a bit of a drive from New Haven, they facilitate all of Connecticut’s skiing and snowboarding. Pre-skiing homework should include more than prices and food amenities; you should also be privy to the terrain before strapping in and heading up.